First, let me say that I really enjoy being home with my daughter. When I was pregnant and still in the 'work force' I had thoughts of being bored or burned out from being constantly home with a baby. Once she was born all those thoughts were gone and I am delighted to be able to stay home and work from home part time. Those of you who have (or had) a toddler know what a challenge it can be to keep those little hands and feet occupied and entertained. This is especially hard in the winter when you are cooped up at home so much. Here is how we spend our days, both being silly and productive. To begin with here is my opinion on entertainment. Babies are born curious and inherently need very little to be entertained. A smiling face in front of them, a ball, an empty box, a wooden spoon. Those are the things they like most. As parents though I think that we are the ones that teach them to be bored. We are the ones buying 'push button' toys in bright colors in unhealthy quantities through toddlerhood. Then we are the same parents wondering why our children are bored when they hit five years old. When we could have been reading to them, we put them in an exersaucer. When we could have been playing outside, we stuck them in front of the television. I am in the same boat with you, trust me - it wasn't and still is not easy to go against all of the norms of society to raise a toddler who doesn't depend on artificial entertainment. So how do we keep busy without television and a room full of flashing, musical, plastic toys? Here is how! Read, read, read! I underestimated just how important reading to small children is until reading something to educate myself on the subject and putting some thought into it. As you might have read in the Life Without TV post, baby E did not have a whole lot of interest in books before we pulled the plug on the black box. She would always favor television over books. But now that is her entertainment. It matters because learning through the written word (when she learns to read) is very different from being fed images and spoken words simultaneously on a 2D screen. Learning from the television can neither compare to real life learning, nor the written word. 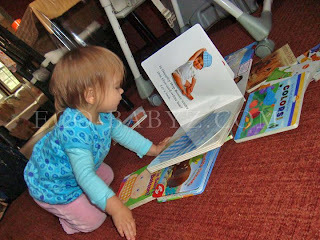 Moreover, if a child enjoys books from such an early age, they are more likely to enjoy reading in the future. The more proficient a child is in reading, the better they learn in school (or homeschool in our case). We take out about six to eight library books every three weeks. At first I read each book to her a few times. Once she knows the story, she can 'read' the picture books independently while I sit next to her and read my own book or go about household chores. As I am reading The Well-Trained Mind: A Guide to Classical Education at Home (Third Edition) , I am convinced that reading is one of the best ways to spend our time. It is both enjoyable and educational. Cook and Bake: Playing can be productive! One of baby E's favorite ways to help me around the kitchen is to mix things. Mix the dough, mix salad, mix pasta, mix rice, mix anything. We bake at least twice a week and she is usually helping me if she isn't playing independently. 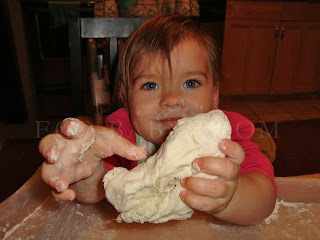 When I make bread I give her a piece of dough to play with. When I make salad she eats pieces of cucumbers, tomatoes, and olives as I make it. She turns on the Kitchen Aid when we make cookie dough. The older she gets, the more she can handle. On rare occasions when she is tired in the evening and I still have some cooking or baking to finish, I put her in the Ergo carrier on my back and she watches me in the kitchen. Music: Though we never have the TV on, we always have background noise. Usually it is classical music, instrumental guitar or piano, or jazz. Baby E also has a few favorite contemporary Christian songs. We eat to music, dance to music, play to music. When it isn't on, she immediately asks for it. Actually, baby E is unusually musically inclined and loves the piano and pretty much any instrument. Every morning she sits down at her toy piano (a broken hand me down) and either asks me to fix it or asks to buy a new one. Outdoors: In the summer we practically live outdoors. Now that it is below freezing we still try to get out at least every other day. 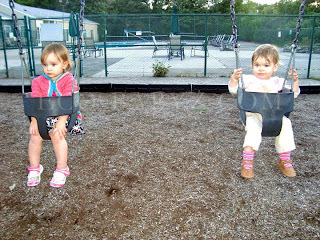 Thankfully we have a playground within walking distance. Sometimes we just go chase each other around some trees. Occasionally I bundle her up in the stroller and we take a walk. Play Ball: What child doesn't like to play with a ball? When baby E was about eight months old, I went to Target and bought a rubber playground ball . Sure it was $8, not $2 like the cheap and toxic vinyl ones. It was a great investment. We've been playing 'soccer' ever since she could walk and now she is so good at aiming it where she wants it to go I can stand in one spot and play with her. We play indoors, but of course if you have a boy who likes to kick it hard, that may be a problem. Draw: Baby E Loves to draw with her triangular crayons . I always have to supervise her when she draws though because she is fascinated with drawing on objects and furniture! Though the magnetic doodle thing we bought keeps both of us happy when I don't feel like getting the crayons out. Dress Up: This isn't something we do everyday, but once in a while my daughter finds something she wants to put on and I let her wear silly outfits. Skype: Without leaving your warm house you can talk to friends far away. We haven't been doing this regularly until the neighborhood friend mentioned below moved out of state. Make a neighborhood friend: We were very fortunate to have found a good friend in our neighborhood just one block away. The little girl is only two months younger than baby E and her mother and I just 'clicked' from day one. We became so close we would visit each other several times a week. Though we were sad when they had to move out of state last month. Of course neighbors like that are hard to find, but if you are in the city or a populated area/apartment building, you'd be surprised how many other children close in age you can find. I am emphasizing close to your home because I am covering everything in this list that requires no driving. Toys: Honestly, with all of the above activities we have little time left for toys! When we do play, out favorites are wooden cubes and marble run, her doll house, doll buggy with monkey, teddy bear, and doll. She also enjoys the small wooden train tracks and train. Sometimes she bounces on the huge exercise ball while I hold her hands. Once in a while she'll play with her abacus and geometric stacking toy. I do find that I first have to show her several times how she can play with something, that way she can play independently longer. We do have more than enough toys, though it would probably about one third of what an average two year old has. It is rare she plays with all of them! 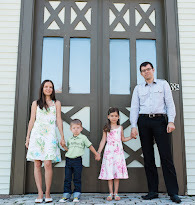 In the next post I'll share what we do for activities outside the home that require driving. Please do share what you do with your toddler at home!